100+ people. 30+ degrees. 2-acres. 1 long table. We arrive at Half Pint Farm in Burlington, Vermont curious, hot, and hungry. 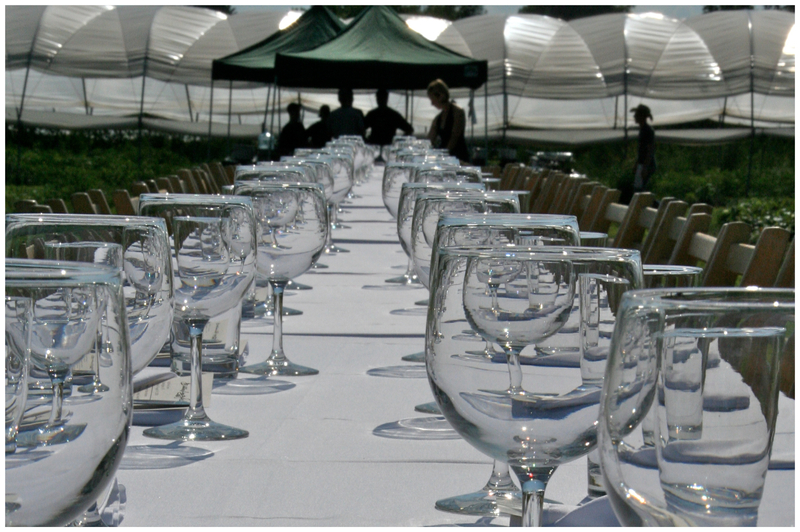 We’re here for the Outstanding in the Field (OITF) farm dinner event that is being hosted by Mara and Spencer Welton of Half Pint Farms. Founded by Jim Denevan, chef and organic farming supporter, Outstanding in the Field travels to farms across the US (and even made it into Canada this summer to Bradford, ON for their first Canadian event) hosting communal dinners as a way to showcase the talented farmers and chefs committed to supporting local agriculture. With a glass of wine in hand, we split into two groups and tour the farm. Mara and Spencer are model-farmers for the new farming movement. Young, hip (how many farmers do you know that wear aviators? ), and determined to prove that you can make a living as a farmer. Managing 2-acres within the Intervale Centre, a 350-acre farmland area along the Winooski River, Mara and Spencer specialize in baby vegetables, hence the name Half Pint Farm. They are supporters of the RAFT alliance, working towards Renewing America’s Food Traditions. By employing sustainable agriculture techniques as they grow heirloom and unique varieties of produce, they are helping to restore the diversity of American food traditions. Mara and Spencer sell at the farmers’ market and directly to restaurants in the area, and their CSA program is in year two, with a total of eight members. After the farm tour, we make our way to the table. 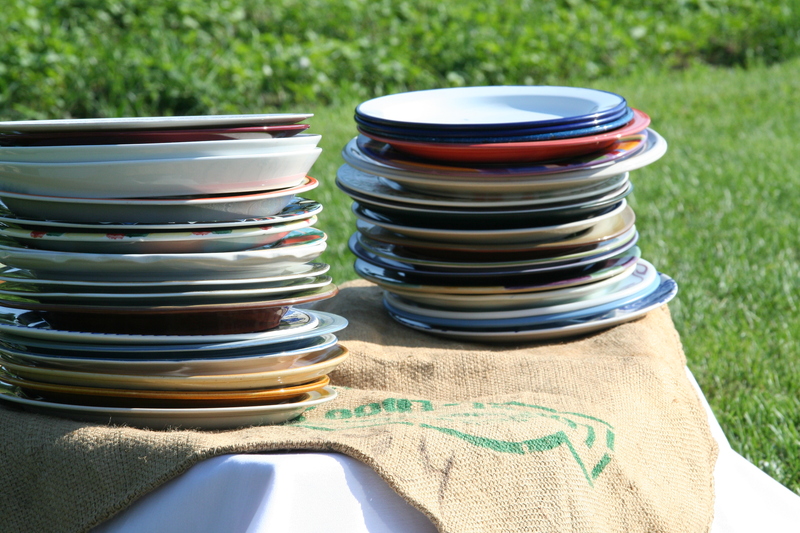 Guests have been asked to bring their own plates. It helps reduce the inventory the OITF team has to trek from event to event, but also creates interesting conversation around the table. I, having traveled from Toronto and not wanting to lug my plate, borrow one of the OITF selections, collected along the way from forgetful guests. We chat with our tablemates. We have diners from Boston and New York on our left, New Jersey on our right. Some guests are here for their second or third OITF event, while many, like us, are first timers. First course arrives. 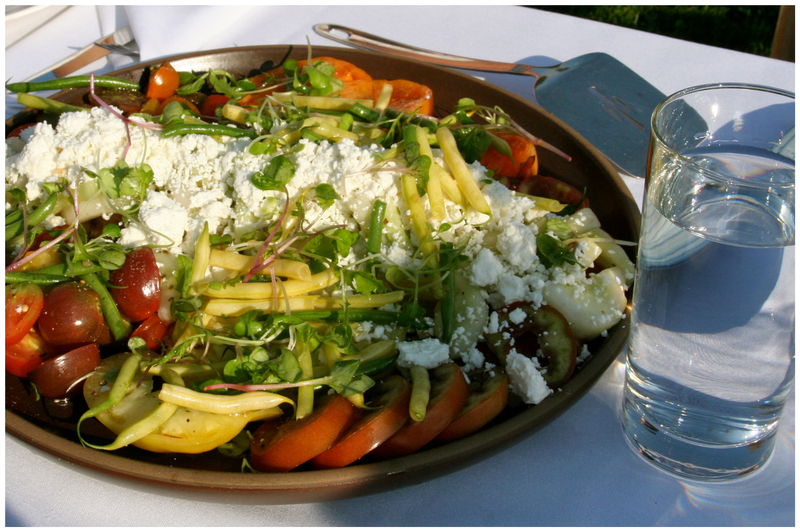 It’s a heaping platter of sliced heirloom tomatoes and field cucumbers, topped off with local Vermont feta. It’s exactly what we need to quench our hunger in the roasting heat. Although it’s almost 6pm, the sun is still beaming down. Wine pairings accompany each course, and we are treated to a Vermont “Traminette” from East Shore Vineyard. Our meal is prepared in partnership with guest chefs Steve and Lara Atkins and the crew from local restaurant Kitchen Table Bistro. Courses are served family-style, allowing us to get to know our fellow diners as we pass second servings of the roasted carrots and potatoes and the lovely local pork tenderloin. By the time dessert arrives, I am not sure I can eat anymore. But then the cream cheese pound cake with blueberries is being passed to me and there is no way I can say no. Enjoying a meal with friends outdoors, talking to the farmer about the care that goes into the raw ingredients, and watching the chef turn those ingredients into something that nourishes and creates so much joy is a very magical experience. Cheers to the Outstanding in the Field team for a truly outstanding evening.